A truly unique home at Hualālai Resort has just been listed with Mauna Kea Realty – A Hawaii Life Company. 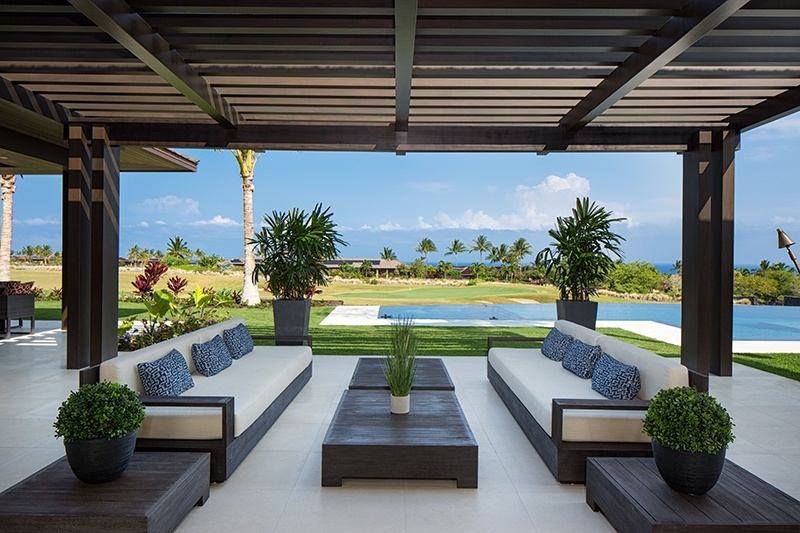 Located along the stunning Kohala Coast of Hawaii Island, this extraordinary property features a contemporary architectural design by Vancouver-based OpenSpace Architecture, a highly-regarded Canadian firm based in Vancouver, British Columbia. Distinctive iron entry gates welcome you to a private courtyard with a mahogany trellis and the gentle sounds of a ledgestone basalt water feature. With up to 24-foot ceilings, oversized windows and elegant mahogany pocket doors throughout, this open-concept home is ideal for a seamless indoor-outdoor living experience. 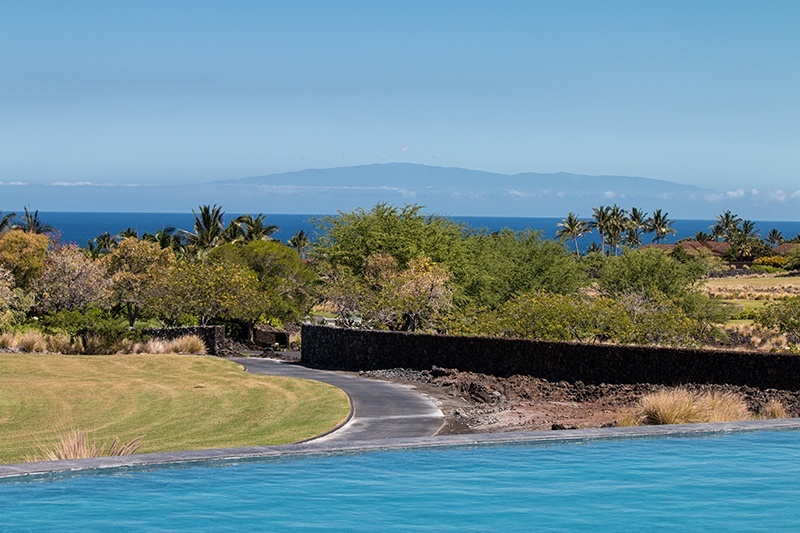 Residents can fully capitalize on the Kohala Coast’s sunny, dry climate in this expansive, 6,400 square foot haven. 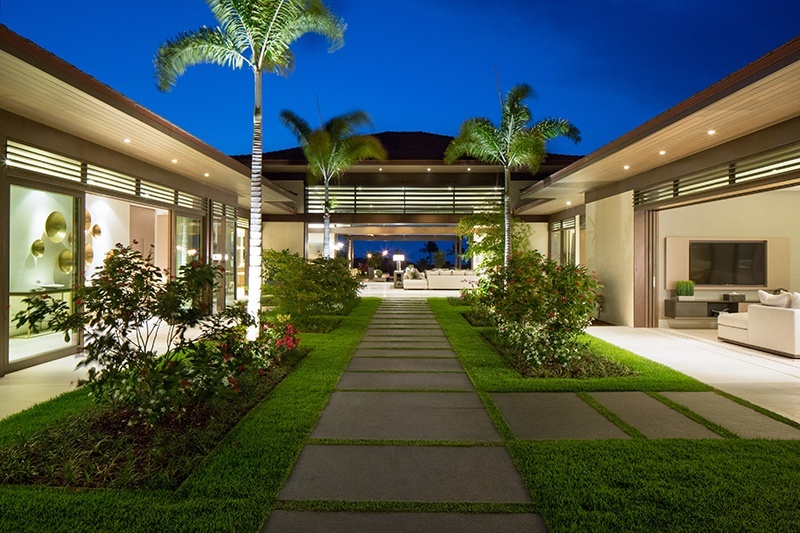 For the past fifteen years, architect Don Gurney and his team have dedicated their OpenSpace Architecture practice to creating distinctive single-family homes in resort locations around the world. Their portfolio of work includes spectacular homes throughout the Pacific Northwest, Japan, and Hawaii. 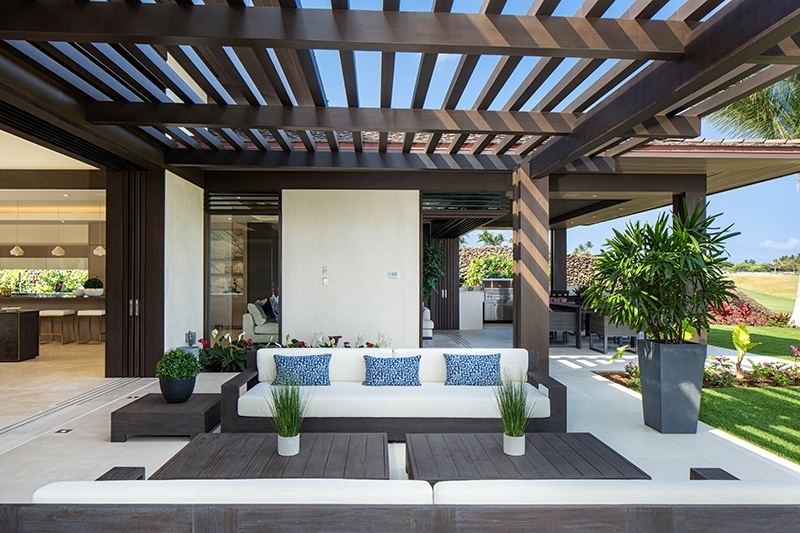 Recognized for their use of timber, cedar and stone in colder climates, they’ve created a fresh take on tropical living with modern, clean lines and a neutral palette that allows the beautiful colors of the Kohala coast to take center stage. The deep blues of the Pacific and the greens of the tropical foliage and grasslands are in sharp relief against the black of the volcanic lava rock used in the outdoor landscaping. 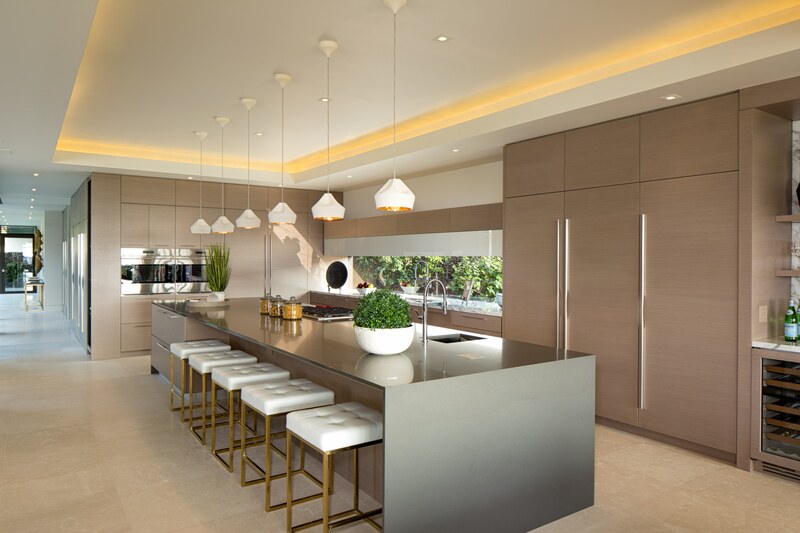 Centered around a gourmet chef’s kitchen that’s part of an expansive great room, OpenSpace kept both form and function in mind when created plans for the home. “Family gatherings are a typical focus of resort homes. Solitude is not often what families are looking for, but rather, they want spaces where family members of all ages can enjoy time together. So many of our designs are open-planned homes,” Gurney shared with us. West-facing living areas and the Master suite open to an expansive lanai, an infinity-edge salt-water pool with oversized spa, outdoor kitchen and bar that are perfect for outdoor dining, with spectacular ocean and sunset views. For golf lovers, the home is nestled above the 10th green of the Tom Weiskopf-designed Ke‘olu Golf Course at the Hualālai Resort. 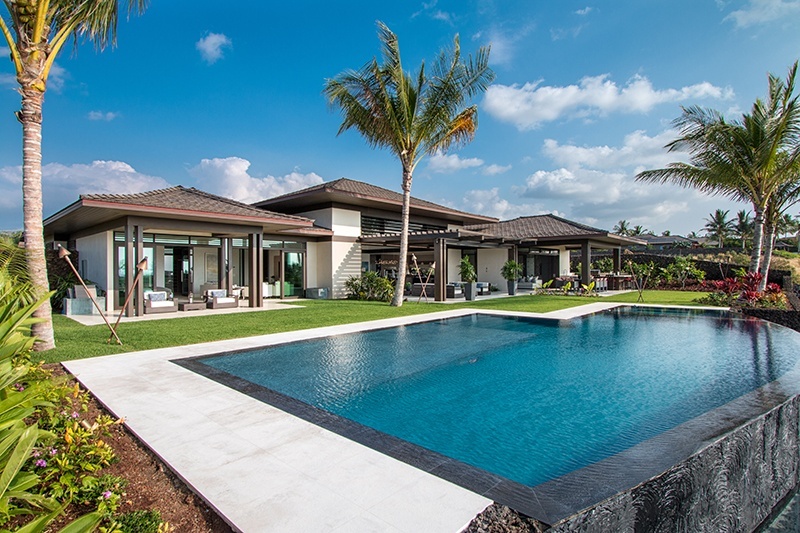 The property’s architectural design had to adhere closely to Hualālai Resort’s design guidelines, which dictate the materials that can be used, the roof forms, envelopes, and even the pitch of the roof for homes throughout this exclusive enclave. The result is not a cookie-cutter design, but rather, a grouping of luxuriously appointed homes that complement each other and lend a sense of place. While the roofline is solid on the exterior of the home, it is punctuated with elegant lattice that provides shade and dappled light. Fixed louvers sit atop the already enormous, mahogany doors throughout the home, which slide seamlessly out of sight for an unobstructed view. The louvers are lined with glass to keep out the elements, but serve to lengthen the views and let additional light into the bright, airy interior spaces. The Chef’s kitchen is a dream for someone who loves to cook or simply to entertain. It features Calacatta marble countertops and state-of-the-art Wolf, Sub-Zero and Miele appliances. The kitchen opens to the expansive, west-facing dining room, great room and family room, which enjoy spectacular sunsets and ocean views. The great room includes a climate-controlled wine room with capacity for more than 700 vintages – perfect for the avid wine collector. Gurney chose volcanic rock as a backdrop for outdoor showers and landscaping, while the broad strokes of the home rely heavily on the clean lines and rich hues of wood. For Gurney, this meant choosing very hardy materials that would factor in Hawaii’s weather and moisture. To adapt to Hawaii’s climate and humidity, he used treated fir in lieu of the more typical ironwood that might be used here.“The result of our choice of materials is a very clean, contemporary take on a traditional home,” he noted. 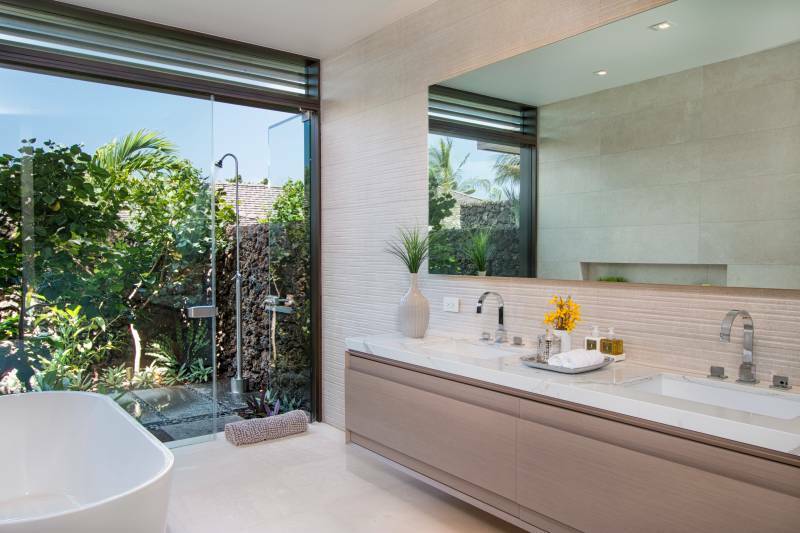 Beautifully appointed bathrooms feature Blu Bathworks™ fixtures, and private, attractively landscaped walk-out shower gardens. Turkish limestone flooring, a Fond du Lac limestone wall, crafted millwork and trim throughout add to the appeal of this property, which includes custom furnishings on par with the elegance and architectural design of the home. Oversized windows maximize natural light, while automated shades keep the home cool. 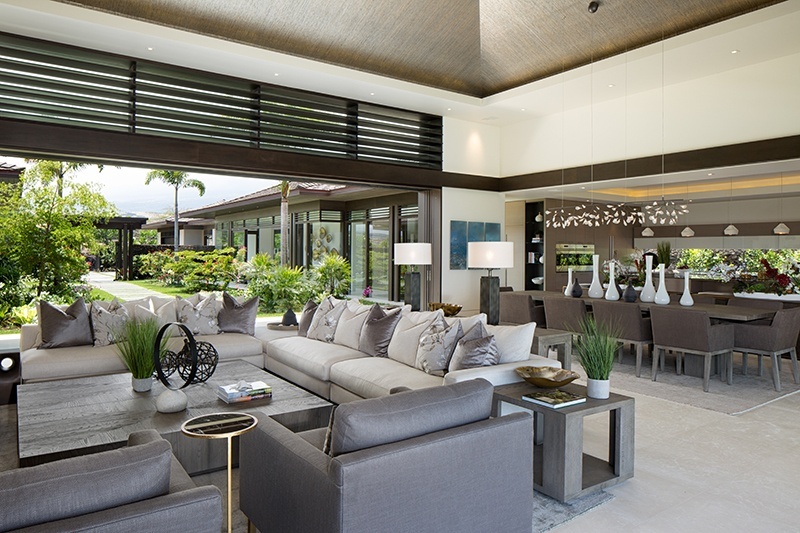 For evenings, a Lutron lighting system highlights beautiful Hawaiian art, and lofty, coffered ceilings. A private study and self-contained Guest Suite with private entry, living and dining areas complete this exceptional offering. Planned landscaping includes a variety of grasses, flowering shrubs and fruit trees, including grapefruit, lemon, lime and avocado. This elegant home is perfect for anyone looking for a private getaway, with access to all the best that resort living has to offer – including championship golf, spas, boutique shopping, watersports, white sandy beaches and some of the prettiest, crystal clear waters to be found anywhere in Hawaii. For information about this spectacular Hualālai Resort property, please visit the listing details here, or contact Steve Hurwitz at Mauna Realty at (808) 937-9000, steve@maunakearealty.com. Steve Hurwitz is a REALTOR(B) with Hawai'i Life. You can email me at	steve@maunakearealty.com	or via phone at (808) 937-9000.